Anse Source d’Argent Beach is one of the most popular beaches of Seychelles. It is located to the east of Praslin and west of Felicite Island. La Digue boasts of a multicultural ethnicity with people from Africa, East Asia, Indonesia, and Europe settling here over the ages. Huge towering granite boulders form the backdrop of this beautiful beach. The shallow and calm water lap gently on the salt-white and flamingo-pink sand. Anse Source d’Argent Beach is a perfect family getaway. La Digue offers a number of activities for the adventurous tourist. While lazing on the idyllic sands of the Anse Source d’Argent Beach is definitely most popular, you can set out for walks and trails. The L’Union Estate, on the southern part of the island is the most visited site in La Digue, apart from the beaches. The centerpiece of this estate is an old plantation house. On one side of this house you will find a pen full of large tortoises, while another side contains a paddock for the estate’s horses. You may also want to visit the Veuve Reserve, to catch a rare glimpse of the Paradise Flycatcher, a critically endangered species. It is estimated that only about a 100 of these magnificent birds are still around. They are found only in Seychelles. Even if you are not an avid birdwatcher, you will be struck by the peace and tranquility of this reserve, not to mention the breathtaking views. Fishing is another pastime which you may wish to indulge in. You can also roam the island and look for colonial era houses. Bicycles are the best mode of transportation within La Digue. There are numerous shops which rent out bicycles. Some of the hotels have their own buses to ferry guests from the jetty to the hotel. If you want to relax while enjoying the beauty of the island, you can hire taxis or avail ox-carts. Once used to ferry heavy loads, the ox-carts are currently used as a means of public transport. Most of the hotels available in La Digue are rather expensive. If you are a budget traveler, it is a better option to plan a day trip and leave by the last ferry at 5:00 pm. There are excellent budget hotels in Mahe. You will be spoilt for choice as the island offers you a variety of fish, pork, curry, and rice dishes at any of its several takeaway restaurants. You can also indulge yourself at one of the resort styled restaurants but these may be relatively expensive. Palm wine is a favorite drink in La Digue. It is prepared by fermenting coconuts. For the weary traveler, Anse Source d’Argent Beach is a perfect getaway – a completely rejuvenating experience. It is perfectly secluded from the hustle and bustle of daily life and maintains an untouched, natural environment. It is homely without the glitz of casinos and hotel activity centers. The Portuguese discoverer Vasco da Gama discovered these islands on his journey to India. La Digue gets its name from one of the ships commandered by the French explorer Marc-Joseph Marion du Fresne, who visited the island in 1768. The total area of this island is around four square miles. Where is Anse Source d’Argent Beach? Anse Source d’Argent beach is located in La Digue, the third largest island of Seychelles. La Digue does not have an airport of its own. To visit the Beach you will need to go through Seychelles International Airport, located on the largest island of Mahe. From there you can charter a helicopter or boat to La Digue. You can also take a ferry from Mahe to La Passe, the jetty on La Digue Island. 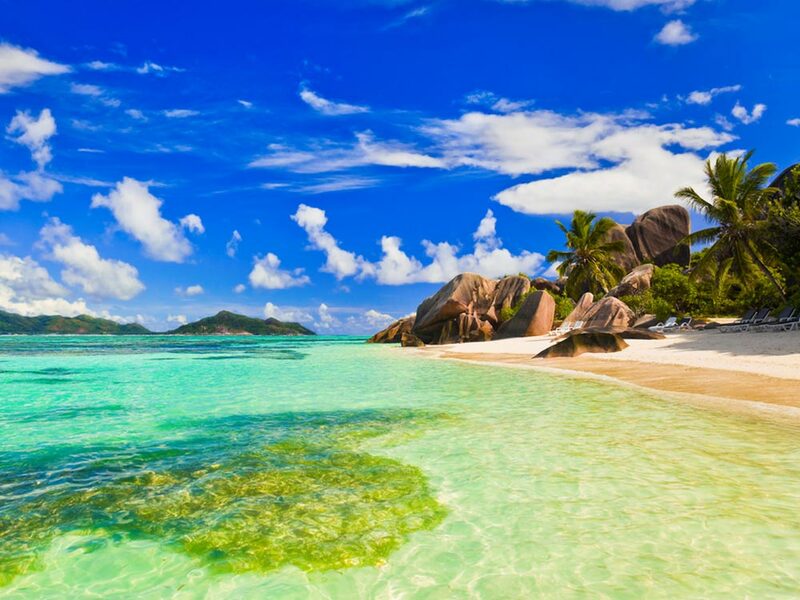 Seychelles, in general, experiences warm temperature round the year due to its proximity to the Equator. The temperature in La Digue is no different. The island receives frequent rainfall and sometimes very heavy rainfall. Temperatures normally range between 24° Celsius and 32° Celsius. Night temperatures are almost the same. La Digue gets the maximum rainfall from October to March. The best time to visit Anse Source d’Argent beach is between May and September as it is less humid during that period. Places to see nearby are: Spiagge di Anse Marron, Anse Coco Beach, Grand Anse and Petite Anse.